The Cynthiana-Harrison County Airport Board received a $1 million grant from the Kentucky Transportation Cabinet Department of Aviation for safety improvements, according to a press release. Gov. Steve Beshear announced the award on June 5 for a 2,757-foot parallel taxiway to the runway. The grant has been on the radar for several years, but the money became available and the priorities changed, said Bobby Craft, chairman of the Cynthiana-Harrison County Airport Board. Craft said that once they complete the parallel taxiway, the airport will expect more airplanes. He said it could be a safety issue with only one taxiway while trying to back up the airplanes to allow for more to land. “It’s going to be nice and it will free it up out there,” Craft said. According to the press release, the airplanes could safely exit the runway and taxi back to park, which would free space for other airplanes to take-off or land. Craft said the airport should be completed by October 2015. An archaeological dig, studies and the design will be developed in 2014. The bid for the proposed $2 million project will start at the beginning of 2015. At 17 years old, Justin Barnes became one of the youngest persons ever to earn their pilot’s license at the Cynthiana-Harrison County Airport. 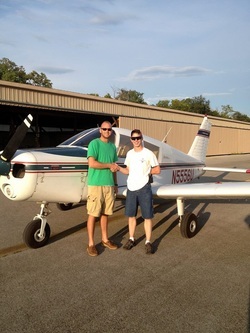 Justin, the son of Karen and Wally Barnes, earned his license last August. He was one of four students to complete the pilot’s course before flight instructor Nick Anderson announced he would be taking his own flight skills to the next level in the United States Air Force. The others taking classes were two doctors and an administrator with Toyota, Barnes said. Flight lessons were not cheap. While he got some support from his parents, it was not something they could afford alone, he said. He had to come up with some of the money in his own. Other teenagers get part time work and summer jobs to someday buy a car. Barnes, on the other hand, spent years saving his money from various jobs in order to afford his flying lessons. “My mom and dad always encouraged me to do this. When Nick [Anderson] came along to offer lessons, it was too good of an opportunity to pass up. It took everything I’d saved, but I went ahead with it,” Barnes said. Flying was something Barnes has wanted to do from the time he was a little boy. And probably even earlier than that. Barnes’ grandfather on his mother’s side, the late Jim Wornall, an Air Force veteran, maintained a pilot’s license all his life. But the influences are not all on his mother’s side, Barnes said. Barnes’ other grandfather, the late Godfrey Barnes, also served in the Air Force and made a living in airplane maintenance. Though neither of his parents have held a pilot’s license, flying and small planes have been important facets of Barnes’ family life. Barnes began taking lessons out at the Cynthiana-Harrison County Airport at the end of February. Within six months, he had completed all of the requirements and passed his check flight, the pilot’s version of the driver’s test. To earn his license, he was required to log at least 40 hours of flight time. Of those 40 hours, half are used for instruction. Ten hours are allotted for general time with or without an instructor, depending on how well the student is progressing. Students must also log a minimum of 10 hours of solo flight with five being cross-country solos to an airport 50 nautical miles away, Barnes explained. “To get those hours in, I’ve flown to the London airport, the airfield in Ashland and to the ones in Somerset and Danville,” Barnes said. According to Barnes, the Cynthiana-Harrison County Airport is an excellent training ground for new pilots. The airfield presents some unique challenges for young flyers, particularly when it comes to landings. “For some reason, Runway 2-9 at Harrison County always has wind, even in calm conditions. 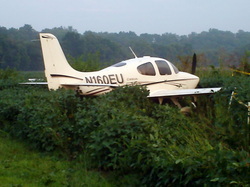 It’s not dangerous, but it forces even experienced pilots to pay attention as they descend,” Barnes said. Another force to which Barnes paid attention was his instructor. “Nick challenged me. Though the regulations for a license require just 40 hours, he says pilots need about 50-60 hours under a lot of different conditions to become proficient flyers,” Barnes said. Anderson’s instruction placed far more expectations on Barnes than what he needed for the check flight to earn his license, he said. “After Nick got through with me, passing the check flight was a breeze,” he said. Barnes is licensed as a recreational pilot, which is what he enjoys doing most. He is not sure whether he wants to pursue this passion into professional life, but he’s young enough to have that option open to him if he chooses it. In the meantime, he is simply satisfied with having accomplished this goal in his personal life. Our community has a “gem” not too far from the heart of downtown Cynthiana and several runners this weekend got a chance to glimpse it. The Chamber’s Earth Day one-mile for Kids and 5K were held out at the Cynthiana-Harrison County Airport. What a beautiful facility the new terminal is and how incredibly fortunate we are to have such an airport in our county. Several of our runners were from out of town, but even many of our Harrison County runners hadn’t realized we had such a gem. In spite of the rain, Harrison County looked beautiful. Hobbies are stress relievers.. when you do them well. If not, you need a hobby away from your hobby. A hobby can rule you if you let it or it can be a tool used to get out of the house and off your wife’s last nerve... Why do you think so many men play golf? I enjoy hunting, fishing, vollyball and I have recently started lifting weights. Bow hunting is the hobby that requires most of my hobby money up until this point. I justify the expense though by bringing food home and strengthening the friendship with my father in-law. While hunting will always be my No. 1 hobby, I’m quickly developing a new one. I say “quickly” because I don’t want my wife to change her mind. In April, Harrison County fell victim to another flood, which caused several acres of farm land and parts of Cynthiana to be under water. Assistant Animal Control Officer Paul Colson told me that Bobby Craft flew frequently and that he would probably be happy to take me up for pictures of the waterlogged city. A few phone calls later and I was equiped with a headset and headed down runway one at the Cynthiana-Harrison County Airport to take some aerial shots of the town. From the moment Bobby pulled the yoke of his Cessna airplane back and the wheels left the secured hard surface of the earth, I was hooked. Now this was not my first time flying in an airplane, but it was the first time flying in a single-engine propeller plane, and I was enjoying every second of it. The ability of having a window seat no matter where you sit! As Bobby flew around Cynthiana, he asked me where I was living and before I had the address out of my mouth, we were headed right toward The Ponderosa. Getting to see my home from an angle I was not used to seeing was neat. As the ride came to an end, I started thinking about how nice it would be to become a private pilot myself. Since that day, I have made several more trips to the air. To be honest, it seems really natural to be 1,000 feet above the ground. Everyone who is involved at the Cynthiana-Harrison County Airport has been extremely welcoming and has done their best to fill my now need to fly. I learned that one of my childhood friends, Nick Anderson, was on a quest to obtain his Certified Flight Instructor certificate, which would enable him to teach flying lessons. Hopefully, I will one day have the opportunity to fly and introduce several youngsters to how incredible it is to enjoy a multi-use hobby. I hope that the citizens of Harrison County understand the importance of the airport and what or who it brings to Cynthiana. The men and women that frequently use the airport are more than generous with their time. I mentioned in a edition the nine pilots that dedicated their time to the Young Eagles Program. Again this week, readers will have the opportunity to see the Silver Eagles getting their chance to go up in a plane. To the pilots, I would like to say thank you for your dedication and time that you donate to the citizens of Harrison County both young and more seasoned. I appreciate the time you have given me, as well, in my drive toward obtaining my private licence. Once I get my licence, you can bet that I will add trips to Florida to my growing list of hobbies. The Cynthiana-Harrison County Airport was the answer to Stuart Marsden’s prayers last Wednesday evening. In need of a runway for an emergency landing, Marsden, 35, found the perfect spot in Cynthiana. According to Ptl. Brian Hassall’s Cynthiana Police report, Marsden was piloting a 2003 Cirrus SR-22 airplane from Cincinnati, Ohio, to Atlanta, Ga., when an oil line blew, spraying and covering the front windshield of the plane. Located about one mile northwest of Cynthiana at 7:30 p.m., Marsden declared an emergency and was told to land at the local airport. “He just couldn’t see because of the oil on the windshield,” said Airport Board Chairman Bobby Craft. According to the report, the plane landed midway down the runway, slid off the right side of the end of the runway and stopped in a soy bean field. Justin Barnes loves being in the air. It’s a passion that began with airplane rides with his grandfather, the late Jim Wornall, who served on the airport board for 40 years. Barnes’ love of planes will only be heightened this summer when he attends the EAA (Experimental Aircraft Association) Air Academy in Oshkosh, Wisc. July 12-17. Cynthiana never looked so beautiful. 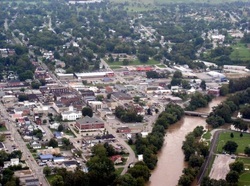 I’ve seen Cynthiana from the air before. I’ve been in the passenger seat of small planes that took off and landed at our own airstrip with the capable pilots of first, Reed Anderson many years ago, then Doug Coy, and Jim Wornall. I’ve also flown with Richard Colvin from the Pendleton County airport. But nothing had prepared me for breathtaking sights to be seen from the backseat of an ultralight. Last Friday, opening night of the new Harrison County sports complex, I found myself in need of a photograph from heaven’s angle. Like many Harrison Countians, I have marveled at the brightly colored motorized parachute being piloted above for several years. The man in the pilot’s seat is Steve Snapp, whom many may remember from the Flood of 1997 with his hovercraft used in countless rescue operations. I rode with Steve then to document the devastation, but Friday’s ride was a vast contrast to the ugly trail of destruction. I was at first apprehensive, but excited, nonetheless. Oh, great, I thought, feeling my stomach rise into my throat. Steve expertly laid the parachute out, declining my offer of assistance. And, Steve is a good pilot, having logged hundreds of hours in both an airplane and his ultralight, the latter he has been piloting since 1988. With camera secured tightly around my neck, Steve directed me to the perch that was to provide my bird’s eye view of Cynthiana. Ear plugs, seat belt... and hold on! We plodded across the grass strip and then lifted toward blue skies. It wasn’t until the craft leveled off that I fully appreciated the view. There before me was vast green fields, an unusual sight for this time of year, but one that was made possible by the rainy summer. We skirted the limits of Cynthiana, allowing the camera’s lens to reach some of the headline-grabbing sights. I took nearly 100 photographs, but still I caught myself just breathing in the beauty and forgetting that I was up there to take pictures. I got my shots and we headed for the grass landing strip. Austin’s words were very close in my mind as we made the approach. “This is going to be bumpy. Just a little bumpy,” I silently chanted. And, then, we were on the ground. Much to my surprise, the “bumpy” was no more so than the ride on the back of my husband’s motorcycle as it passes over some of Harrison County’s pitted and pot-holed highways. In the coming weeks, you may be treated to some of the photographs that my lens was able to capture. We tried to hit the spots that either have been or will be in the headlines. Thanks to Steve, you will have a different angle.